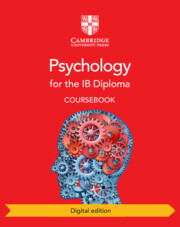 Delve into human behaviour by studying real cases in this Cambridge Elevate coursebook for the IB Psychology syllabus. Through studies of famous psychologists, students learn about the diversity of human behaviour and the factors that influence our decisions. Case studies and concise definitions of concepts make this an ideal resource for learners whose first language is not English. Exam-style questions at the end of every chapter help students prepare for assessment. This digital resource covers both Standard and Higher Level content and suggested answers to the coursebook questions are at the back of the resource to help students with self-study. The ‘Newsflash’ feature gives examples of psychology in the real world, providing context to students’ learning. The coursebook covers all aspects of the revised syllabus, including cognitive processing in the digital world. Links between Theory of Knowledge (TOK), critical thinking, international-mindedness and psychology help reinforce core IB skills. Exam-style questions at the end of each chapter, test students’ knowledge and help them prepare for assessment. ‘Critical thinking’ questions encourage students to investigate concepts, topics and examples further. A free teacher’s resource is available from ibdiploma.cambridge.org. 10. Approaches to researching behaviour.